If you own more than one trailer, you know what a hassle it can be switching back and forth between ball mounts and keeping track of which ball mount fits with which coupler. 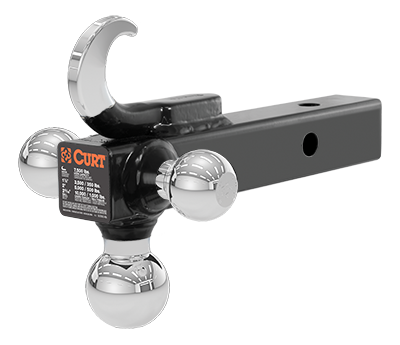 CURT has made things simpler with the multi-tow ball mount. These ball mounts feature two or three trailer balls mounted onto a straight shank. The trailer balls come in different sizes and towing capacities, allowing you to accommodate various coupler sizes and loads. The 1 7/8” trailer ball can tow up 5,000 lbs. of gross trailer weight and 500 lbs. of tongue weight. The 2” ball can handle 7,500 lbs. of GTW and 750 lbs. of TW, and the 2 5/16” ball accepts loads up to 10,000 lbs. with 1,000 lbs. of TW.